Yes, only a Zune enthusiast site would care about such things, but hey, we are what we are. I had downloaded the v1 Zune software yesterday before the new stuff came out, just in case I ever needed to use it again. 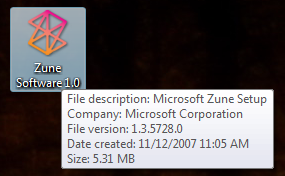 Note the nice Zune icon, and the file version of 1.3. The file size is a relatively svelte 5.31 MB. The new Zune software, on the other hand, is a bit of a mystery. 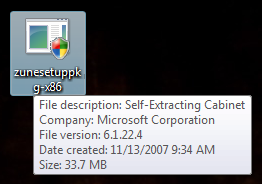 It has a nasty looking generic Windows icon, is version 6.1 (where did we lose five versions? ), and is a hefty 33.7 MB in size. Kind of curious, no? The mysteries never end with this whole Zune thing!